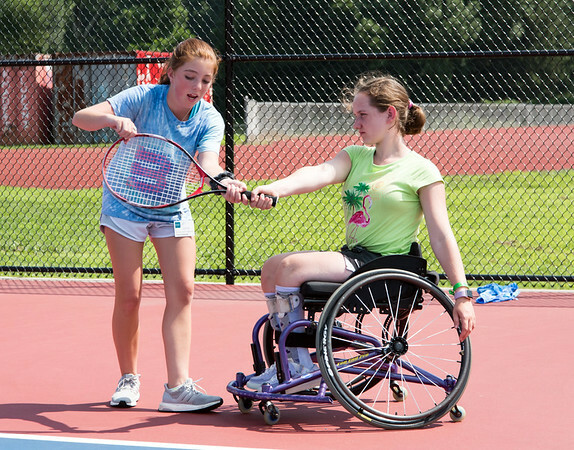 BERLIN - For many, summer is a time for camp, and the Hospital for Special Care’s Ivan Lendl Adaptive Sports Camp, now in its 28th year, helps open that experience up for many who might not otherwise have a chance. The week-long, free day camp is being held at Berlin High School this week for young athletes age 6 to 19 living with physical disabilities. But the Adaptive Sports Camp does more than just introduce kids with disabilities to sports; it helps children create strong bonds and relationships that will last a lifetime. With 42 kids registered at this year’s camp, the Hospital of Special Care provided experienced specialists, mentors, volunteers and adult athletes living with physical disabilities. Connolly said that some of the coaching staff is made up of Paralympics-level coaches and athletes who were successful in their sport and serve as role models for the campers. Ivan Lendl, a retired professional tennis player and member of the International Tennis Hall of Fame who was the world No. 1 for 270 weeks in the 1980s, visited the camp on Wednesday. Lendl spent time with the kids during their lunch hour, posing for pictures and signing autographs. Dana Albrycht, who swam in the 1996 and 2000 Paralympic Games, was also taking part in the Adaptive Sports Camp. During the Games, he specialized in the 100-meter butterfly, 50- and 100-meter freestyles and 200-meter individual medley. Albrycht was born with a deformed hip socket, causing his right leg to be shorter than his left. When he was just 11 months old, his leg was amputated because it would have limited his movement. Albrycht has been helping coach the swim team at the Hospital for Special Care for the last year. When Connolly asked him to help out at this year’s camp, he did not hesitate. It’s not just about sports for Albrycht. Natalia Jeblonski of New Britain and Maggie Fusco of Southington, both 15, are veterans of the camp. Jeblonski said this was her fifth year attending, and Fusco said she couldn’t remember because she’s been doing it for so long. Both said the best part about camp is getting to hang out with friends and play all the different kinds of sports. Posted in New Britain Herald, General Sports on Wednesday, 8 August 2018 20:00. Updated: Wednesday, 8 August 2018 20:02.